You've heard of the post-election violence that erupted in many parts of the North that caused the murder of a lot of our youths who were involved in the NYSC. 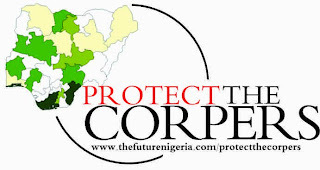 Well, the #ProtectTheCorpers project s doing something about it and we need your help! Please call 08053737313 or email "mailto:protectthecorpers@thefuturenigeria.com" or info@thefuturenigeria.com to sign up and for inquiries.